I have been having a love affair lately with all things coconut. It is just so yummy! So, I am sharing another delicious coconut creation that was inspired by my Coconut Strawberry Muffins. 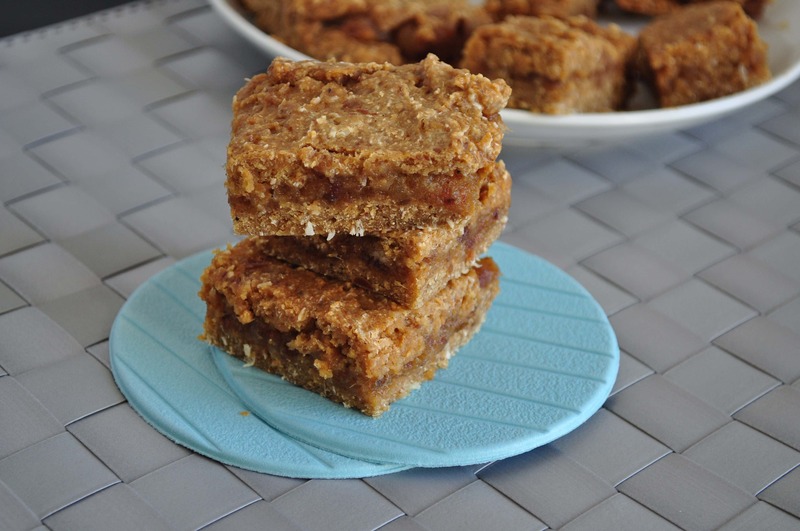 These are my Coconut Date Bars! For these I used chickpea flour again. After I made my Strawberry Coconut Muffins, I thought the dense texture that the chickpea flour produces was much more suited for a brownie/bar type recipe. So here goes. In a small food processor or magic bullet , mix the dates and water until you get a paste-like consistency. Mix all the dry ingredients for the bars in a large bowl. Mix all the wet into a medium bowl. Line an 8X8 pan with parchment leaving enough room for a bit of parchment to come out the sides. This will make the bars easier to remove when cooled. Spread a thin amount of batter so the whole bottom of the pan is covered. The batter will be a bit sticky. Once the bottom is covered, spread the date paste on top. Finish with the remaining amount of batter and place in the oven for 15-20 minutes. Let the bars cool completely before removing from the pan and cutting. Once they are cooled, grab the ends of the parchment paper and lift the whole thing out. I'm not familiar with chickpea flour. Would whole wheat flour work as a substitution? Yes you can grind any dry bean or rice and make flour of it. I use my coffee grinder. Do you melt the coconut oil or leave it solid? Oh ok! Good to know thank you! Yes you can. I think that would be fine. I'm having difficulty with the layering part. I can't get the date mixture to spread nicely. Tips? Help! It's a little tricky since the batter is sticky. I used a frosting knife. If you have one, it works great.